Extends drill bit reach by 6"/10"
6" Drill Bit Extender overall length 7-1/8"
10" Drill Bit Extender overall length 11-1/8"
Requires a minimum 3/4" hole for use. Will not work with bits under 3/4". Not compatible with Maxi-Cut bits. 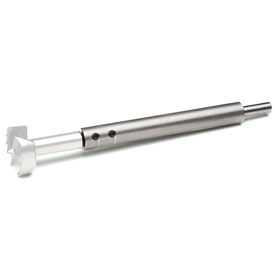 This drill bit extender is designed for use in the tailstock of a wood lathe where it remains stationary when drilling. A drill bit extender should NEVER be used in a drill press or any other powered equipment as it may result in serious injury. DO NOT exceed 500 rpm when drilling. Comments On Sep 16, 2018:This certainly gives the reach I was looking for. The drill bit is held well by 2 set screws. However, using hexed shaft bits appear to work better. This extender works well in my keyless chuck, also. It is strongly warned not for drill press use. Lathe only. Comments On Aug 02, 2018:This works very well, but I wish that I had ordered the shorter one. Comments On Jan 13, 2016:Very good extension and runs true. Comments On Sep 24, 2015:I have the shorter extender and have used this for drilling holes for flower vase projects. It is very durable and easy to use. Have a set of hex keys on hand. I have a mini lathe (18" bed) and would be hard to use any longer extender. Perfect for my uses or for shorter pepper mills. Comments On Aug 27, 2015:This is a solid piece of steel. It is machined very nicely, heavy duty and worked very well. Comments On Oct 19, 2014:Solid and heavy, gets the job done. I used it with cheap Forster bits to drill out pepper mills. The screws hold the bit in place tight. Comments On Sep 26, 2014:The drill bit extender is an excellent tool, and necessary for getting deep in many works. Sturdy, and easy to use. It should come withg a caution however, that the shank will bend if your piece is not secure before drilling. Comments On Sep 17, 2014:A 'must have' for every woodworking shop. Adaptable across a variety of bit manufacturers and of very good quality. Craft Supplies' Customer Service did a good job in recommending this product. Comments On Sep 06, 2014:As mentioned in the product description these are an excellent way to drill the long holes in a peppermill. They extend the reach of any 3/8" shank drill bit. I have found many ways to use this accessory! Comments On Sep 07, 2014:This is the perfect extension for pepper mill projects. Very pleased with the extension. Comments On Jul 06, 2014:It just does what they say it does. I recommend drilling as far as you can without it before adding this. I get better results that way. Nice addition for drilling to depth. Comments On Mar 05, 2014:Works fine. Only wish it could be used in holes smaller than 3/4". Comments On Nov 11, 2013:I use this for boring deep holes with Forstner bits in vases and other projects. The two set screws hold the bit very securely, and the machining on the extension itself is very good, allowing the bit to run straight and true. Highly recommended. Comments On Sep 27, 2013:I bought the 6" extender and used it on both the lathe and the drill press; stellar performance in each case. Solid, strong, and steady. I'm 100% happy with this product.